Take a look at your fingers for a moment. They’re… sort of average looking, aren’t they? Sure, they’re useful when you’re trying to open a can of soda or when you need to type an essay, but what about when you’re trying to dress up like some kind of hideous monster? Where’s the gross factor? Do you really think that you’re going to scare your friends with some normal fingers? Do you know what creature has some seriously creepy fingers? The octopus. Okay, so maybe there’s some argument over whether or not a tentacle is an arm or a finger, but we do know that they’re kind of creepy. If you want to really freak your friends out, then wouldn’t it be great if your fingers were a little more like tentacles? 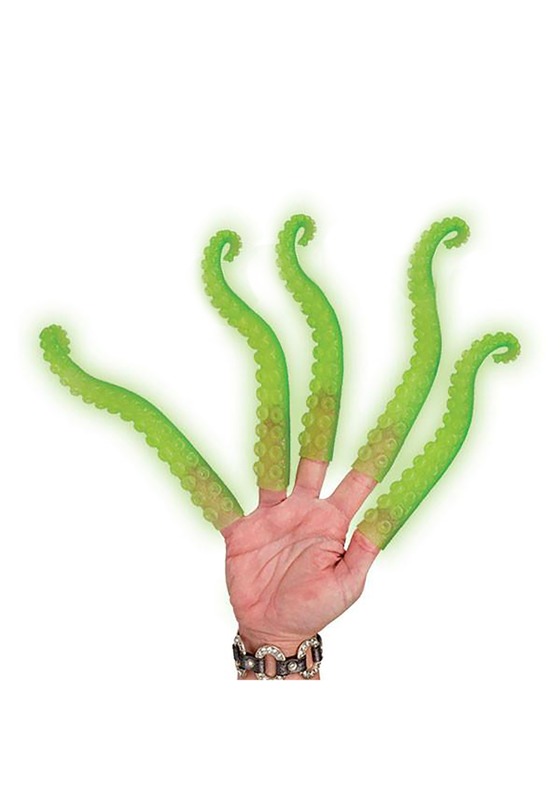 Now, you can turn your fingers into tentacles with this glow in the dark tentacles set. The set comes with molded tentacles that fit quite easily on your fingers. Each one has a green, translucent design, but really glows in the dark with you turn out the lights! Pair this tentacle finger accessory with any monster costume to create a totally creepy look. Or you can continue having ordinary, non-scary fingers.